The Sonics stink. It’s okay to say it; we’re not exactly hurting any sacred cows by stating the obvious, right? There’s plenty of talk about whether Derrick Rose or Michael Beasley would better help the Sonics, about which player would be the best fit via free agency, or whom Sam Presti should send packing this summer. All of that is important to the future of the franchise (as is, of course, where the team will be playing, but we’re all a bit tired of that, right?). But part of the fun of being a Sonic fan – heck, all of the fun these days – is remembering the better days, when Shawn Kemp dunked, Gary Payton scowled, Tom Chambers gunned, and Gus Williams wizarded. Which leads me to this, if you could pluck one player from Sonic history and transplant them to 2008, who would you grab? Would it be Payton and his non-stop talk and defense? Or would you rather see what Kemp and Durant could do in combination? What about Spencer Haywood; he’d be a nice fit alongside Green and Durant, right? Don’t forget Jack Sikma’s scoring abilities as a big man, or DJ’s leadership as a combo guard, or Gus’ ability to score 30 points in any game. You can’t forget the X-Man, not if you’re a real fan, anyway, although the Sonics need another small forward about as much as they need out-of-state ownership. Personally, I’m going with Payton without hesitation. You put vintage GP at the point, swing KD to the 3, use Green as a swingman between the 3 and 4, trade Earl/Ridnour/Wilcox to get a serviceable 2 in the summer and now you’ve got yourself a team. Of course, you have to factor in Gary’s continuing desire to destroy the confidence of younger players, but I’m guessing he’d act a little different around a youngster such as Kevin Durant than he would around, say, Moochie Norris. It’s ridiculous fantasy, I know, but when your team is on the verge of leaving for Oklahoma and entering the lottery in the same season, well, you don’t have much else, now do you? The end of the season can't seem to come soon enough these days. Normally, a team mired in losing inspires thoughts of draft-day gems in the minds of its fans, but not this team, not these fans. The Sonics were down a point with 50 seconds left, but Earl Watson's turnover keyed the Bobcats' win, and yet another loss for Seattle. The Sonics won the 2nd and 3rd quarters, but it was the 1st and 4th quarters that killed them, especially surrenduring 38 points to Charlotte in the opening period. PJ Carlesimo was less than thrilled with the starters' intensity in the first quarter, something we as fans are just a little bit familiar with. Once again, Mo Sene sat glued to the bench for the entire game, a mystifying experience for the young center, and a frustrating one for those of us trying to figure out why exactly he was promoted to Seattle from Idaho. Watson had a good night offensively, but allowed Ray Felton to go for 23 points on the defensive end. Not that it's the biggest deal; the Sonics are not exactly chasing down any playoff aspirations. If anything, it helps the team's goal of losing as many games as possible down the stretch. In any event, Chris Wilcox' right pinkie is hurt enough that both he and the team decided to shut operations down for the remaining ten games. In other news, Gary Washburn details how Earl Watson is not into "moral victories" and misses the playoffs, David Stern also kept talking, but, well, I think you know where we stand on that sort of thing, and Art Thiel says that the city is - again - talking to the state legislature about funding the missing $75 million from the KeyArena deal, having realized that all other options are not going to play out. Thiel quotes Deputy Mayor Tim Ceis as saying, ""The city can't do this on its own. We need a partnership with the state if we're going to [get a stadium deal done]." Oh, and the Sonics play the Bobcats tonight at the Key. You know, if you like watching basketball or something. Lou Gehrig and Babe Ruth didn’t have to care. Nobody asked Whizzer White or Sammy Baugh if they had an opinion. In 1936, in Berlin, the Olympics were Nazi Germany’s crowning achievement, a chance to show the world how wonderful Deutschland could be. Even more, it was an opportunity for Adolf Hitler to demonstrate to his populace the magnificence of the Third Reich, how he had thrown off the shackles of the ignominy of World War I and restored the Fatherland to its rightful place among the elite of the world’s nations. Nobody asked Gehrig, Ruth, Baugh or White because they had nothing to do with the Olympics, because no one had yet figured out that bastardizing every principle the Olympics stood for could be financially rewarding. So amateurs toddled off to Berlin – despite evidence showing that almost 50% of the populace wanted a boycott – and Hitler had another moment in the sun before the devil summoned him back home. 2008 is not 1936, though, not by a long shot. It is plainly evident that China – a nation that kills monks for speaking out, that detains dissenters for decades in work gangs when it’s not killing them, that executes thousands of people every year in stadiums, that backs the hideous government of Sudan in the brutal murders of hundreds of thousands of Africans in Darfur – is well aware that the Olympics is a stage from which the host country can advertise its magnificence to the rest of the world. Even Steven Spielberg, never shy about making a buck, pulled out of orchestrating the opening ceremonies. “At this point, my time and energy must be spent not on Olympic ceremonies,” Spielberg said, “but on doing all I can to help bring an end to the unspeakable crimes against humanity that continue to be committed in Darfur." "We believe, however, naively, ... that sports has something enormous to offer the world," David Stern said recently to the Associated Press. "And we also believe that the Olympics is a sporting event, and indeed, has a history in ancient times of being a time when war stopped so that people could play together." The “naive” Stern is not alone. Dwyane Wade has spent the better part of this season resting up from injury in order to be better prepared for the Olympics. He echoed his commissioner right down the line. “My job is to play basketball, to worry about the game. We'll let the Olympic Committee worry about everything else,” Wade told the AP. I wonder, would Stern, a Jew, feel comfortable about sending his athletes to compete in Nazi Germany, knowing that the profits from the Olympics were being used to build gas chambers? Would he continue to spout inanities about the Olympics being a “sporting event”? Or, rather, in this hypothetical world of 1936, would he grow a conscience and take a stance on the side of humanity rather than money? Decide that the large amounts of money to be made by the NBA in expanding to the lucrative German market were not worth the bloodshed? Part of me hopes that people are capable of seeing depravity and evil in their own time, rather than only with the hindsight gained from history books. Part of me hopes that Dwyane Wade and LeBron James would say, no, we don’t want any part of a two-week festival honoring a country that forces women to abort their children and sells the organs of executed political prisoners. But most of me knows that a blindfold sewn from a billion Chinese Yuan covers David Stern’s eyes. As you've probably heard, Clay Bennett has generously offered to leave our history, team name, and old jock straps behind when he steals our basketball team. David Stern (busy getting "wowed" in Oklahomie) seemed to back down yesterday from his previous hard-line stance against the NBA "ever returning to Seattle", hinting that we might someday get a new team if we play nice with Clayface. It's an interesting scenario. If we "own" our history, does that mean we could erase the Bennett Tragedy, granting Sonics fans a "do-over" for the past three horrible years? Hey, it worked for Spider-Man (sorta). As tempting as it might be to forget that Mo Sene or Wally Szczerbiak ever wore a Sonics uniform, we would also be forfeiting the future legacy of Kevin Durant, and the struggles it took to get him would have all been in vain. Imagine the '85 Bulls moving to Butte, Montana (The Butte Bulls!) with Chicago receiving the Clippers as a consolation prize. Do you think Chicagoans would enjoy watching Jordan and Pippen hoist those six banners in another city, while they got stuck with Michael Cage and Benoit Benjamin? Maybe, a long time from now, these three years of hell will only be a blip on the radar (or a "just a comma" in history as GW likes to say). Perhaps someday, after a brief hiatus from basketball in Seattle, we'll raise a new championship banner into the rafters of Microsoft Arena next to the hallowed '79 version, while the Bennett Boys are relegated to the dustbin of history, along with fellow carpetbaggers Ken Behring, Jeff Smulyan other long-forgotten villains of Seattle sports past. This isn't a horrible fate. Brooklyn never got a second chance at the Dodgers. After all the bad blood between the uppity city council and the ego maniacal commissioner of the NBA, it's somewhat of a miracle that the possibility still exists. And yet, I'm still not eager to embrace this offer. We're still being robbed. If someone steals your beloved family dog, but gives you a new puppy two years later, does that excuse the crime? I want Bennett and Stern to come out and admit collusion. I want Stern to tell the world that there was never any real opportunity to keep the Sonics in Seattle--that this was a back room deal of the sleaziest variety to get his pal Bennett a team by any means necessary and to scare other cities into giving owners whatever they want in the future. I want Stern to step down from the office which he has disgraced. The chants were ringing from the rafters, and, for one night at least, it was fun to be at KeyArena. The Sonics managed to pull one out, knocking off the Blazers to snap an atrocious 11-game losing streak. More importantly, a number of players commented on the "Save Our Sonics" chants that echoed throughout the not-close-to-a-sellout arena, with some attributing the success of the team to the vocals from the fans. Not surprisingly, PJ Carlesimo is still holding the reigns on Mo Sene. For some ridiculous reason, Carlesimo has decided that it makes more sense to give 16 minutes to Francisco Elson than to the former first-round draft pick who was summoned from Idaho earlier this month. Elson - who figures in no way, shape or form into the Sonics future - is taking minutes away from Sene, who dominated the D-League and absolutely deserves a shot at some minutes. But let's focus on the positive. The Sonics mustered up a well balanced attack, Johan Petro scored 10 points in one quarter, Luke Ridnour nearly finished with a double-double, Seattle shot 50% from beyond the arc, and Jeff Green and Kevin Durant were solid contributors, scoring nearly 40 points between. For one night, being a Sonic fan was something to be proud of again. I try not to take sports too personally. It's not a healthy way to live. Why invest emotionally in something that A) is bound to disappoint and B) has no emotional investment in you? And yet, I continue on, like some kind of battered house wife who repeats over and over again "He's a good man!". After 11 eleven losses in a row, the Sonics are almost assured of finishing with the worst record in franchise history. With the league in cahoots with Bennett to steal the team away, what's a Sonics fan to do? Pray for a post-Easter miracle? Be content with re-watching tapes of the 1996 playoffs? How are you dealing with this Super sub-Sonic season? Watching other teams? Getting outside more? Booze? Supersonicsoul wants to know . . . and know quick, before we jump into the Sound. Washington State is named after the United States' first president, George Washington. The state government is represented here by a caricature of George. There's a joke being made here that may require some knowledge of the Sonics' arena situation. It may not even be a funny joke. George Washington never really played basketball, but did you know that his teeth were made out of whale bone? Yes, this should have come out a week ago. Maybe I'm a bit too much like George myself. If a bear relieves himself in the woods, and no one is around to hear him, does he make a sound? I wondered about that after David Stern's latest comments, disdainfully terming the Sonics' latest arena proposal a "public relations stunt." As Tim Ceis mentions in the same article (from Greg Johns at the PI), the city has stopped listening to Stern's pronouncements. If that's the truth, and I believe it to be, then exactly who is Stern trying to bully with his words. Sonics fans? We've long stopped getting indignant about Stern's nonsense. Seattle politicians? They already can't stand him. Olympia? Please, they wouldn't give Stern a drink of water if he was perishing in the desert. I can only conclude that Stern is trying to sway national public opinion, and that's a sorry tactic for him to take. After 41 years in the same city, the city of Seattle and a billionaire-led ownership group contribute $300 million towards the redevelopment of one of the most crowd-pleasing arenas in the league. The Sonics trample over the goodwill in the only city they've ever known and move to Oklahoma City, into a new arena that is currently due to receive $100 million in refurbishments. Oh, and the ownership group is led by people with approximately 1/3 the total wealth. Oh, there's a PR stunt all right, but it's being executed by the senile leader of the NBA, not the people in Seattle. Let's say the arena situation was resolved and the Sonics were in no danger of leaving. With that in mind, would you be worried about the future of this team, strictly looking at it from an on-the-court perspective? Does Sam Presti's "culture" nonsense from the offseason outweigh the rudderless direction of this sinking ship? 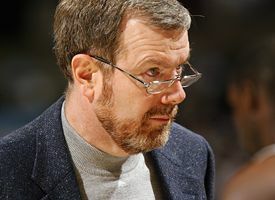 Do you have confidence that PJ Carlesimo is the right man to be guiding Kevin Durant's, Jeff Green's, and (possibly) Derrick Rose's collective futures? Do you have any belief that this franchise is going to win a playoff game in the next two to three years? How many games will this team win next year, with three rookies getting the most minutes, absolutely nothing cooking in free agency, and PJ running the show? 25 wins? 20? Can we call someone from the Warriors' old front office staff to let us know how best to run a non-playoff team for a decade? Your best player, Durant, seemingly plays the same position as your second-best player, Green, you've got no help at center or point guard, and if you don't get one of the top two picks this year, you won't have any next year, either. Not exactly a recipe for success, if you ask me. Okay, it's hard the day after a debacle like Sunday night's in Denver to have any thoughtful insights into a team's future, but, man, I am the only one thinking these thoughts? Anybody get the license plate of the truck that ran over the Sonics on Sunday night? I'm all aboard with what Kenyon Martin said to the AP after the game, "A lot of people are going to think it's a misprint." Exactly my sentiments. I didn't watch the game, but I was watching Sportsnet's show at 10 pm last night ("We cram 90 minutes of hockey into 60 minutes of news! "), saw the ticker with the score at the bottom of the screen, and did a double-take. I could go all Jayson Stark and start listing numbers upon numbers about how bad it was, but the bottom line is the Sonics gave up 168 points and lost by 52. According to Gary Washburn and Jayda Evans, Mo Sene is back with the big club, albeit on a temporary basis, as the nagging injuries of Francisco "World B." Elson and Nick Collison necessitated the young Senegalese center's return to Seattle. Evans points out that Sene will likely return to Idaho from whence he came when the D-League club gets closer to the playoffs. Perhaps he can give a seminar to his green and gold teammates this summer entitled, "What It Is Like to Play After the Regular Season." In other news, with his aborted tryst with the Northwest firmly in the rearview mirror, Clay Bennett has commenced relations with Oklahoma City. In exchange for $40,000 in rent per game, Bennett and his associates are asking for parking in the downtown area, sharing in ticket and concession revenues, naming rights to the Ford Center, and a tax rebate from the state. In exchange, the Sonics will give the city $24 in cloth and shiny buttons. Olympia may have passed up on the Sonics, but Seattle's Deputy Mayor Tim Ceis says the city is not throwing in the towel. With an April 10 deadline looming to take advantage of the $150 million offered by the new ownership group, Ceis told the TNT's Eric Williams that "we’re going to give it our best shot." Ceis admitted that coming up with the missing $75 million expected from the state will be difficult, but thought something could be done. Art Thiel has a well thought out piece discussing the situation at the PI, while Greg Johns runs down the possible next steps in this ongoing saga (and gets in more than a few digs at David Stern while he's at it). At this point, the next move belongs to the city. It seems that the powers there are firmly in support of the Sonics, so the only moves to be made are finding ways to come up with $75 million, whether it be selling the arena to the new owners, adding more tax to the proposed admission tax, or some other machinations. Today the Washington State Legislature voted on their budget and, if they adjourn as scheduled will have failed to even address our issue despite the flood of calls they have received. Last night Governor Christine Gregoire joined other politicians in commenting on our massive display of support. She provided some hope by seeming to embrace the idea of a special session and declaring "I understand how passionate Sonics fans are. I've known that all the way along. I'm a Sonics fan myself. I know how passionate taxpayers are. I've heard from them loud and clear," but I don't think you should ever think that conversations are dead until they Sine Die in Olympia. Today we have a report that calls to Gregoire are running lukewarm in support of this statement. Perhaps because many sports fans feel that they have already called and that our job is done. Our loud message is getting through to people and there is still significant chance for success. Please continue your support and call the Governor to POLITELY tell her you appreciate her comments and are counting on her to help save the Sonics. We're in it till the end! Most seasons, the NBA draft is a gigantic game of ring toss, with each team hoping the seven-foot guy with the decent footspeed turns out to be more David Robinson than Rich King. But some seasons, the gods smile upon the drafters and they are given a bounty of solid options from which to choose. 1998, 1995, and, of course, that hallowed year of 1984, when teams chose from Michael Jordan, Hakeem Olajuwon, Charles Barkley, and John Stockton (and Michael Cage, lest we forget). This past June was supposed to be one of those drafts, with all sorts of experts weighing in on the talent available. With two picks in the top five, the Sonics and their fans should have been dancing in the streets, right? Leaving aside the arena situation, why are we, well, less than thrilled with the results? Kevin Durant’s shot selection has been mocked from coast to coast, but he is still the odds-on favorite to win Rookie of the Year, and no one disputes that his career appears bright. But Jeff Green, that second selection, fifth overall? The guy with the college experience? The Pippen to Durant’s Jordan? What of him? In a way, Green’s year has mirrored the opinions of him: not bad, but not good either. Green is seemingly too small to regularly play power forward, yet he doesn’t seem especially suited for small forward either. His stats bear that out. Obviously, Green’s numbers are lacking. Of course, PER is but one measure of a player’s worth and I am quite sure his defenders could produce a litany of reasons for why he ranks the worst. Doesn’t look so good, does it? It is one thing to be the lowest ranked man in a list of five, but another entirely when you rank 19th out of 19. I won’t re-create the entire lists here, but Green ranked 14th in true shooting percentage, 17th in effective field goal percentage, 16th in assist percentage, last in offensive rating, 18th in win shares, and last in steal percentage. To be fair, Green did fairly well in rebounding, ranking 8th in rebounding percentage. And to say his career is over after less than a full season would be a foolish argument to make, but I doubt that anyone could argue that Green’s season has been somewhat of a disappointment. Even David Thorpe, who constantly ranks and re-ranks the rookie class for ESPN, has Green slotted as 16th in his class, two spots below Glen Davis and nine below Carl Landry, two second-rounders the Sonics traded away. Will it mean anything for his future, though? It is important to note Felton, Harris and Wade all dramatically improved their passing skills as their careers progressed and Williams became a much better rebounder statistically this season. People are not machines, and to say Green’s accomplishments, or rather the lack thereof, this season are the sum total of his capabilities is silly. There is plenty of upside to Green’s future, and I won’t be type of person who says that the Sonics made a big mistake in taking him. It’s just too early to tell all of that. With that said, though, if you find yourself reading this off-season that the Sonics’ front-office attributes Green’s numbers to first-year troubles, well, I guess you know a little better, don’t you? Another loss, another step closer to Michael Beasley or Derrick Rose. There are 17 games remaining in the Sonics' schedule, and, perhaps, 17 games left for the Seattle SuperSonics. Of those 17, I would suggest the Sonics will be favored to win three, meaning the Sonics' record at the end of the year would be 19-63, easily the worst in franchise history. Last night's debacle against the Celtics - the Sonics led in the first quarter! - put Seattle's record at 16-49, ahead of only the 3 M's - Memphis, Minnesota, and Miami. After looking at the schedules, I figure Minnesota will likely win five games, giving them 19 wins for the season, matching the Sonics. Memphis could win three more games, giving them 18 wins, while Miami should easily finish with the worst record in the league. Where does that leave us? It leaves Seattle and Minnesota tied for the third-worst record in the league, meaning those two would be fighting over Jerryd Bayless, Brook Lopez, O.J. Mayo, or Deandre Jordan, among others. Man, it's hard to shake the "Major League" vibes with this team, isn't it? In a battle of teams in a headlong sprint for the lottery, the Pacers topped the Sonics last night in Indianapolis to the tune of 114-107. Not unexpectedly, the two defensively inept clubs managed to combine for 175 shot attempts. Even less unexpectedly, Chris Wilcox managed to follow up Gary Washburn's piece describing his "improved play" by turning in yet another stinker - hitting 6 of 16 shots from the field, 1 of 5 from the line, and 5 rebounds in about 30 minutes of play. All together now - Chris Wilcox has been inconsistent, is now inconsistent, and will forever be inconsistent. Every year for the past three years, we've read stories about how he's "turned the corner" and added this or that skill to his offensive repertoire. And every year, he follows up a spate of double-double performances and monster dunks with a week's worth of 12 point-5 rebound stink jobs. The Sonics' front office and the media can talk all they want about how they want to keep him around in their future plans, but I can't imagine you'd want Kevin Durant spending any more time than is absolutely necessary around Chris Wilcox. And, as always, there's a bunch of arena news to read about. Personally, the whole situation has got me to the point where I just don't give a damn any more. "Why do you hate Seattle so much?" "Why did you collude with your pal Clay Bennett to steal the Sonics? "Why have you systematically alienated blue collar fans of the NBA and replaced them with millionaires in luxury boxes who don't even pay attention to the game?" "Have you ever played basketball in your life?" "Is it true that ninety-nine percent of the perceived success you've had managing the NBA has in fact been due to the talent of players like Magic Johnson, Larry Bird and Michael Jordan?" "With schools, roads, and emergency services scraping for money, do you think it's the responsibility of working class tax payers to bail out millionaires like yourself and Clay Bennett?" Feel free to jump in and add your own questions! Just throwing this out there - let's say your television only had two channels. One channel was broadcasting tonight's game between Indiana and Seattle, the other was airing a two-hour "Best of Airwolf" series. How often would you switch back to watch the Sonics' game? Because, obviously, you would be spending the majority of your time watching Airwolf, right? Yes, it's been that kind of season, Sonic fans. You know sometimes you'll hear beat writers or people associated with professional basketball make comments to the effect of, "I can't believe they pay me to do this! "Well, I'm guessing nobody's saying anything like that tonight.In one corner, you have the Pacers, who, along with the Sonics and Timberwolves, are at a level of popularity only cushioned by Mike Gavel. In the other, you have the Sonics, of whom we need not comment. 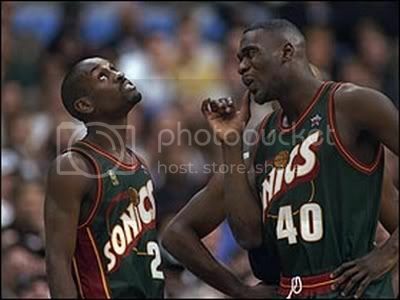 It's truly sad that if this is the end of the Sonics in this city, that we must see them go out like this. For no other reason than to freshen the taste in our mouths, you ought to phone the governor and tell her to do something to keep this team around. Can't we qualify for disaster relief or something? Isn't what's going on right now as bad as Mt. St. Helens or the floods? Your assignment for tonight's game is to come up with a metaphor to describe your interest level. For example: I'm about as excited to watch tonight's Sonics-Pacers game as Johnny Carson was to see Ed McMahon's name on his call-display screen. As you have no doubt read in the PI, the governor and the state legislature have punted the arena issue back to the city of Seattle, asking the city to come up with the state's share of the $75 million on its own. The city, naturally, is not interested in that scenario, meaning, of course, that this situation will require even more pressure on your representatives. Again, you can phone the state at 1.800.562.6000 to let them know you consider this to merit their involvement. On a side note, much has been made of the fact that this week spells the end of this particular legislative session, and that if by Friday no bill has been passed regarding the arena, then that will be that. Which got me to thinking, what are the rules governing special sessions convened by the governor? From what I have read, it appears that a special session may be called either by the governor, or by a 2/3 majority of the house. In this case, it would be Gov. Gregoire calling the session, because if the House could muster 2/3 majority to call a special sessions, they would just as likely use that majority to pass a bill. However, I could find no information as to deadlines on when the governor can call the session. She could call it on Friday, she could call it on St. Patrick's Day, she could call it on Memorial Day, or she could call it during the upcoming trial between Seattle and Clay Bennett. And one final side note, while sports fans only seem to care about the political process when it intrudes upon their turf (yes, awful pun, I know), there are those who are more in tune with this system. And, it seems, those people are about as thrilled with Frank Chopp as the rest of us. Fed up with Chopp's stalling tactics? Join the club. In a letter to Gov. Gregoire and published in the Seattle Times, the four men expressing interest in buying the team stated that their offer will expire on April 10, essentially rendering moot any argument from legislators that this scenario would be better considered during the next session. So, have you made the call? If you're interested in keeping this team around, and you feel that this particular offer is a good one, then you better make it. Call the legislature and let them know that - as a voter - you feel they should act before it is too late. "Mr. Stern, there’s a Mr. Bennett on line 2 for you." DS: Okay, thank you, Andrea, I’ll take the call. DS: Hello, Clay, how are things in Oklahoma City today? CB: Well, that’s not why I’m calling, David. This situation in Seattle is startin’ to go sideways a little bit. You told me when I bought this team that we’d have smooth sailin’, and now it looks like that female governor is startin’ to change her mind. DS: Clay, Clay, Clay. Don’t worry, it will all work out in the end. CB: Now see here, Stern, I didn’t spend $350 million of wife’s father’s hard-earned money just to live half the year in that hippie-infested rainforest. You told me that those people were a bunch of whiny liberals that would never approve a new stadium. So long as I played like I was goin’ to try to get a new arena there, you’d back me up about movin’ to Oklahoma. DS: Yes, well, things have changed a bit now. Perhaps an alternative arrangement will have to be made, but don’t worry, I have a myriad of possibilities lined up. CB: I don’t want other possibilities, I want this team and I want it in Oklahoma. Now are you going to back me or aren’t you? DS: Now, Clay, I advise you not to get so agitated. After all, with the Board of Governors meeting coming up in a few weeks, I believe it is in your best interests to keep a civil tone in these proceedings. CB: Now what the hell does that mean, Stern? Are you tellin’ me you all are thinkin’ about denying me from movin’ this team to Oklahoma? DS: Not exactly, Clay. Perhaps the best resolution to this scenario is a franchise swap, yes? Michael in Memphis is quite fed up with the franchise there, and he and I have spoken at length about the possibility of you taking over his team, and moving it to Oklahoma. It’s really not a concern. CB: Excuse me? You tellin’ me I’m givin’ up that Durant fella, my boy Sam, PJ, and all those draft picks, and in return I get the gol’ darn Grizzlies? That doesn’t sound like much of a fair swap to me, Stern! DS: Ah, Clay, well perhaps you would rather I deny the franchise relocation, force you to sell, and leave Oklahoma City with no team altogether? I’m sure we could arrange a D-League team to play at your new arena. CB: Now wait just a cotton pickin’ minute. Why am I gettin’ the feeling I’ve been used? Now see here, Stern, did you just get me to buy this team so you could trick Seattle into building a new arena? DS: Now, Clay, I would never trick anyone. If you buying the team forced Seattle into doing what I wanted them to do all along, while simultaneously giving me a new arena in another town which I can now use as leverage against the next city which defies the NBA, well, what’s wrong with that? CB: You dirty little halfpint. I can’t believe I got suckered in. I knew I should have dealt with them hockey folks. At least you know where they’re comin’ from. Now what about my money? Am I goin’ to get my $350 million back? Well? DS: I’m sorry, Clay, but I have to take another call. What will happen this week? It's anybody's guess. In one moment, Gov. Gregoire and the other legislators seem to indicate that there is just no way anything can happen regarding the Sonics in this session, an indication that this team is just as good as gone. But in the next, you get indications that the politicians are merely dabbing their toes in the water to get a feel for the temperature. With the hot-blooded vocals of thousands of Sonic fans calling them every day, they must know that this particular issue is one that resonates with voters. 2) Getting the NBA to deny his relocation request. If you love the Sonics, shoot, even if you just tolerate the Sonics, then get yourself down to Olympia tomorrow for a rally at the Washington State Legislative Building. The rally is to be from 10 to 11 am on Saturday. Visit SonicsCentral.com for specific information on parking, meet-up locations, etc. With the word from Gov. Gregoire today that she is considering extending the legislature's session beyond the expected Friday drop dead date, there is hope for those who want to see the Sonics stay in Seattle. Yes, Clay Bennett is "refusing" to sell, but he said he would never sell the Storm, either, so take his current tactics for what they are worth. As always, the government will stick with their position until it looks as though enough voters are against it. By rallying in Olympia, you can tell them what you think of the Sonics. The magical trifecta of Gary Payton, Shawn Kemp and George Karl reunite for one night only, tonight on the The Best Damn Sports Show. If you ever studied economics or science or anything besides English in college (and I'm saying this as an English minor), you'll recall that feeling when the information you are trying to absorb becomes overwhelming, and your brain begins to reject sentences, paragraphs, or entire books. So, let this be your Cliffs Notes version of the recent activity surrounding the Sonics, a new ownership group, and the redevelopment of KeyArena. -Slade Gorton, former Senator, begins looking for groups to buy the Sonics in an effort to thwart the efforts of Clay Bennett to relocate the team to Oklahoma. Gorton is able to interest Steve Ballmer (no introduction needed) and John Stanton (founder of Western Wireless). -Ballmer contacts local developer Matt Griffin to get involved in the project as Ballmer doesn't have the time to go through all the details. Griffin in turn contacts Jim Sinegal (founder of Costco) to join the group. -Gorton takes over the reigns of the city's lawsuit against Bennett & Co.
-After initially proposing $75 million of their own money towards the redevelopment project (in addition to whatever cash is necessary to buy the team), the group boosts it to $150 million. -The city of Seattle contacts the legislature that a legitimate group is interested in buying the team and redeveloping KeyArena. -The city declines an offer of $26 million from Clay Bennett to buy out the remaining two years of his lease at KeyArena. -Oklahoma City passes an initiative to raise $120 million towards the redevelopment of the Ford Center, the last road block standing in the way of the Sonics moving to their city. -At a press conference in Seattle, the Mayor, the group of four owners, Gorton, and the council announce their plan to spend $150 million of the owners' money, $75 million from Seattle via admission taxes or leases, and $75 million from the state an extension of state taxes on bars, restaurants and rental cars in King County for a combined total of $300 million towards the redevelopment of KeyArena. -The Washington State Legislature closes on March 14, 2008. Speaker Frank Chopp, through his mouthpiece, states that it is unlikely this particular piece of legislation will be completed in time for the legislature's closing. It is suspected, however, that Chopp is posturing, and that a special session, called by the governor, may be likely to occur. -The NBA's relocation committee meets April 17-18 in New York to discuss the possibility of moving the Sonics to Oklahoma. They will, no doubt, take into consideration the state of affairs in Washington, as well as the pending lawsuit involving the team. -The City of Seattle and the NBA will tangle in court over the remaining two years of the lease at KeyArena, and whether the Sonics are obligated to honor those years, or if a simple buy-out is all that is required. 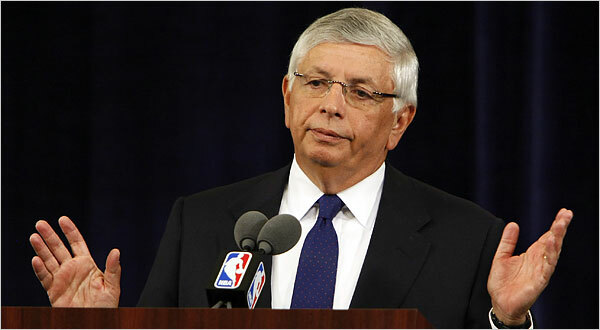 It is expected that - should the case reach trial - David Stern, Clay Bennett, and other NBA officials will be subpoenaed. -In reading the proposed legislation submitted to Olympia, it is difficult to ascertain who will be paying for the (inevitable) cost overruns. -There is, of course, no guarantee that the owner of the team 10 years from now won't need a revision to the lease, or other, more expensive, improvements. (Lest we forget, Barry Acklerly was the owner when KeyArena was first completed, and no one envisionaged in 1996 that a new ownership group would be begging for a new stadium within a decade of the old one's completion). (The majority of this information was culled from crosscut.com, the News Tribune, and the Times). Well, try not to get too depressed when you read this article from the PI's Greg Johns and Chris McCann. "There is absolutely no chance of us considering it this legislative session," Morris said. Morris went on to comment that this current proposal, which would combine $150 million in private contributions with $75 million from Seattle and $75 from the state, is a good one, but that it is impossible for the state to make it happen in the remaining week before the end of the legislature session. A special session, which would be called for by Gov. Gregoire, is a possibility, of course, but comments such as those from Morris certainly put a damper on things. "Mayor Greg Nickels will hold a press conference this afternoon to discuss a new proposal to improve KeyArena and Seattle Center. The mayor will be joined by a representative of a new, local professional basketball ownership group." The way the news has gone the last couple of days, I'm almost expecting Bill Gates to show up. Or maybe Jimi Hendrix. Lost amid the high-pitched talk of Steve Ballmer being a partner in the group looking to buy the Sonics, the team actually played a game last night. Unfortunately, you'll note that I was only pointing out offensive performances, as Petro allowed Andrew Bogut to grab 23 points to go with double-digit rebounds, and Charlie Villaneuva - apparently left unguarded in the Sonics' innovative new "Box and None" defense - finished with 32 points on 26 shots, making some observers wonder if he wasn't channeling Sidney Moncrief or Junior Bridgemann last night. Finally, while it appears the Sonics may be headed out of town in a couple of seasons, Luke Ridnour and Mickael Gelabale have decided there's no sense waiting until the moving vans show up. While their bodies reside in Sonic uniforms, their games have long since left town. What's more wholesome and old-timey than a county fair kissing booth? I really, really wanted to add Stern as the carny, but ran out of time. Am I the only who is beginning to feel like a child in a custody case? On the one hand, dad just got the okay from the bank to build a new house for himself in another town. On the other, mom is sweet-talking some new guys down at the country club and there's a chance she might get them to build her a house with an in-ground pool, game room, and all the other stuff. If you can't decipher that convulted metaphor, here it is in plain English: Oklahoma City passed its sales tax initiative, clearing the way for the Ford Center to be remodeled and made NBA-ready. At the same time, the Sonics appear to have solidified their local ownership possibility, with a $300 million KeyArena renovation package on the table, the money being split between private and public concerns. According to Matt Griffin, the lead spokesman it seems for this private group, the private money is not a problem. The public money? Well, the plan calls for $75 million in state funding and $75 million from the city of Seattle. As someone who routinely decries the continual bailing out of private interests by public funds in these situations, I have to say I like this package. The $150 million in private contributions from the prospective owners gives the city/state something usually lacking in these situations: a financial tie-in. Note that Bennett's plan for Seattle called for zero money from his pocket in the $500 million palace he asked for, while this plan calls for a 50/50 split. By ponying up $150 of their own money, the new owners would be unlikely to want to uproot the team 10 years from now, not to mention the fact that they are all, well, local. at the end of one quarter, the Seattle Salary Dumps are leading the Detroit Pistons 41-28, and Earl Watson has scored 12 points. Can I get a rain-check on that optimism? Looks like the election results for the Ford Center Tax come down with 61.8% yes, 38.1% no. Somewhere, Clay Bennett is taking a bath in $100 bills right now. Oh, and the Sonics lost a 3-game to the Pistons. Seattle followed up a 41-point first quarter with a 13-point dud in the second (yeah, I saw it coming, too, smart guy). The starters did their job by scoring 86 points, but 11 points from the bench didn't quite cut it. 4 of 17 shooting by the reserves didn't help. As I’ve said before, I’m hesitant to comment on the Oklahoma City initiative regarding the Ford Center. After all, no matter what comment I make, it will be taken as interference in something which is, truly, none of my business. Cub Reporter: Hey, I was reading some stuff about how stadiums aren’t the economic drivers they’ve been made out to be. How about I do some writeups on that? I could study the situation in other cities, do some comparisons, you know that sort of thing. You know, like Green Bay. Or Jacksonville. Do the writers assigned to cover Sunday night's "contest" between Seattle and Minnesota receive hazard pay, especially in light of the fact they had to stick around for an entire extra overtime period? The game was a tale of two halves, with the Sonics dominating the first and throwing away their good efforts in the second, before rebounding to grab a win in OT. Luke Ridnour's 3 with 11 seconds remaining in the fourth was a key, as was Kevin Durant's layup with 4.2 on the clock. Statistical leaders included Durant's 7 turnovers (ouch), Ridnour and Earl Watson combining for 28 points and 16 assists, Chris Wilcox with an 18-15 performance, and a 14-8 from Nick Collison. How do you lose a game to the worst team in the NBA, at home no less? Hey, no job's too lax for the Men of Bennett! The Heat rode Dwyane Wade's coattails to their - wait for it - first win on the road since December. The Sonics have now dropped four straight and are about to begin a seven-game road trip. Can you say 10-game losing streak? Chris Wilcox keyed the Sonics' success for the first three quarters, finishing with a season-high 30 points, and Nick Collison registered yet another double-double. Yet despite all that, the Sonics were unable to beat a Miami team led by a gimpy D Wade and minus their third-best player, Udonis Haslem. Johan Petro followed up his strong performance against Denver with 0 points in about 15 minutes of play, while Mickael Gelabale hit 1 of 8 shots to finish with two points. On a side note, here's some homework for the weekend: In his column on espn.com, writer Bill Simmons floated the idea of Sonic fans staging a protest by walking onto the court en masse at some point during the rest of the season. The thought being that such a move would garner national attention and drawing some much-needed publicity to the plight of Sonic fans. Your homework is to come up with some alternatives to this idea. For example, noting the half-a**ed way Clay Bennett has tried to keep the Sonics in Seattle, perhaps we could leave a game at halftime and not return. We're open to other suggestions, so feel free to shoot us a note with your ideas in the comments section. Please try to use something other than anonymous so that if your idea gains some traction you can receive the adulation you deserve.